Earlier this year, we discussed a proposed bill in the Florida legislature that would allow judges to issue “elder abuse injunctions” to protect vulnerable adults from exploitation. That proposal is now law. Gov. Rick Scott signed the bill on March 27, 2018, and it took effect on July 1.
Who Does This Law Protect? The law is targeted at helping “vulnerable adults.” This does not just mean the elderly. It refers to anyone over the age of 18 who cannot perform “the normal activities of daily living” or otherwise care for themselves due to a medical condition or developmental disability. The short answer to this question is that exploitation means misusing a vulnerable adult’s money or property for something other than their interests. For example, if a child empties their elderly father’s bank account and uses the money to buy herself a new car, that would be exploitation. Similarly, if you are named as a relative’s agent under their [power of attorney] and you misuse that authority to waste the relative’s money, that would also qualify as exploitation. 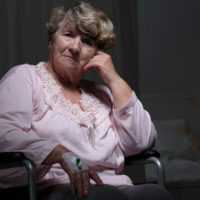 The new law states that the vulnerable adult, their legal guardian, a person seeking guardianship, or any person acting on the vulnerable adult’s behalf with their consent may ask a judge for an injunction to stop actual or imminent exploitation. What Does an Injunction Cover? include any other terms that the judge deems “necessary for the protection of the vulnerable adult or his or her assets,” which may include instructions to law enforcement. Can a Judge Issue an Injunction Without a Hearing? Yes, a judge may issue a temporary injunction “ex parte,” which means the subject does not have to be given advance notice or an opportunity to present a defense to the court. Such temporary injunctions should only be used, however, to prevent immediate and irreparable harm to the vulnerable adult. And the temporary injunction must last no longer than 15 days, after which time the court must conduct a final hearing before issuing any permanent injunction. What Should I Do If I Know a Vulnerable Adult Who May Benefit from an Injunction? This is a new law and it will take some time for Florida courts to sort out how it will work in practice. For now, if you suspect a family member is the victim of exploitation, you should contact a qualified Fort Myers elder abuse lawyer to learn more about your options. Call the Kuhn Law Firm, P.A., at 239-333-4529, to speak with someone today about your situation.